Hello, and welcome to my first blog post. Over the coming months I’ll keep you updated with photos and happenings in my garden. Follow this link if you would like to find out more about me and the Bellinger Valley. August is a wonderful month. There’s a hint of spring in the air, and the garden, which has been dormant over winter is now full of blossom. 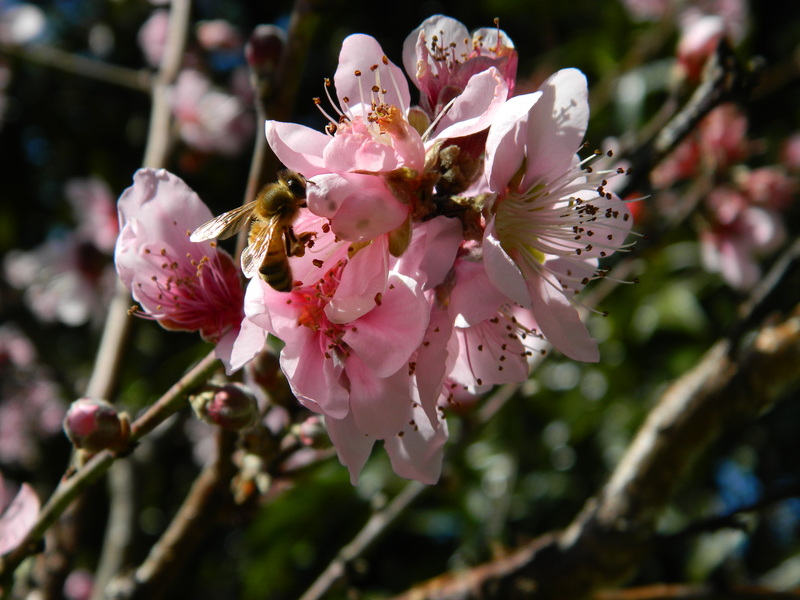 The apple, pear and apricot trees are in bloom and the bees are loving it. The ground here never gets cold enough to produce a crop of apples or pears but the beautiful pink blossoms will produce a small crop of apricots. However … the birds or bats will feast on anything soft and sweet, and I always seem to be just 24 hours too late! The rainforest birds which disappear into the bush over winter have returned, and the garden is regularly visited by bowerbirds, catbirds and honeyeaters. The call of the catbird is a wonderful and quirky thing – somewhere between a cat call and a baby crying.